The Russians also conspired to hack into computers of state election boards, secretaries of State and U.S. companies that supplied software and other technology related to election administrations. 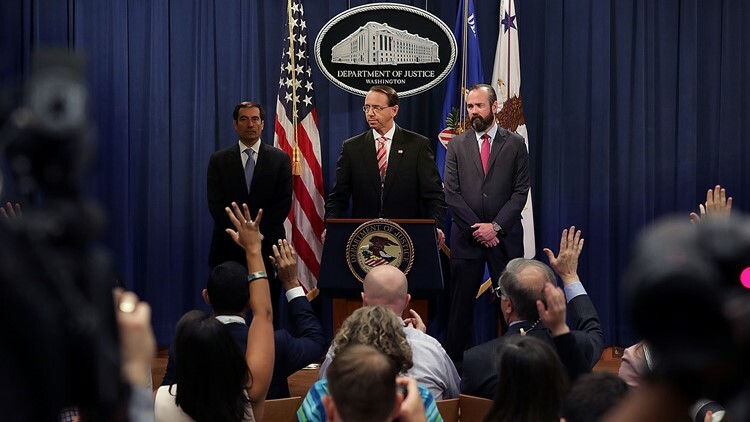 Twelve Russian nationals were indicted for hacking into the Democratic National Committee and the Clinton presidential campaign in 2016, the Justice Department announced Friday. The 12 defendants, all Russian intelligence officers, "engaged in a sustained effort to hack into the computer networks of the Democratic Congressional Campaign Committee, the DNC and the presidential campaign of Hillary Clinton," special counsel Robert Mueller alleged in his indictment. Mueller charged that the purpose of the conspiracy was "to hack into the computers of U.S. persons and entities involved in the 2016 U.S. presidential election, steal documents from those computers, and stage the release of the stolen documents to interfere with the 2016 U.S. presidential election." These are the first charges from Mueller's probe that directly accuse the Russian government of attempting to influence the 2016 election. Still, the indictment contained no allegations that the actions altered the vote count or changed the outcome of the presidential race. "The Internet allows foreign adversaries to attack America in new and unexpected ways," Deputy Attorney General Rod Rosenstein said. The group also allegedly conspired to hack into computers of state election boards, secretaries of State and U.S. companies that supplied software and other technology related to election administrations. Because the Russian officials remain in Russia, it is highly unlikely that they will ever be prosecuted in the United States. Nevertheless, the U.S. action follows a practice of so-called "naming and shaming" of foreign government operatives implicated in actions against the U.S. The 11-count indictment included charges of conspiracy, aggravated identity theft and money laundering. Federal prosecutors asserted that the Russian hackers corresponded with "several" Americans. Rosenstein said there was no evidence that the Americans were aware that they were corresponding with Russian intelligence officers. Rosenstein said he briefed President Donald Trump on the case earlier this week, prior to Trump's scheduled meeting with Putin in Helsinki on Monday. The deputy attorney general said the announcement of the charges were made with "no regard to politics," adding that the evidence was "sufficient" to bring the case. The suspects, according to the indictment, were attached to two military divisions of Russia's Main Intelligence Directorate, known as the GRU — Unit 26165 and Unit 74455. In 2016, Unit 26165 operatives allegedly launched spearphishing campaigns — sending misleading emails to targets in attempts to steal usernames, passwords and other personal information — against the Clinton campaign.